Casino poker is a variety of online table poker games, like Heads Up Hold'em, Casino Hold'em, Caribbean Draw poker, Baccarat, Pai-Gow, and Red Dog, which are offered by British, UK and other online casinos. We have many casino table poker game reviews for you to read in different online casino software. Read about RTG casino poker (RealTime Gaming), BetSoft casino poker (BetSoft Gaming), NuWorks casino poker (NuWorks Gaming), Rival casino poker (Rival Gaming), Microgaming casino poker, and other casino pokers below. Table poker games that are offered by online casinos have become a big hit in the online gaming industry since the turn of the new century. And the online casino table poker games are very realistic by how they are played, as compared to actual brick-and-mortar casino table games, with the use of electronic random card generators. In online casino table games, or casino poker, there's a large variety of poker games to choose from; not just Texas Hold'em. You can play table poker games like 3-Card Rummy, Red Dog, Tri-Card poker or Three Card poker, Caribbean poker, Pai Gow, and Baccarat, plus other types. More recently online casinos have started to add real money online live dealer table poker games, we have listed those casinos here. 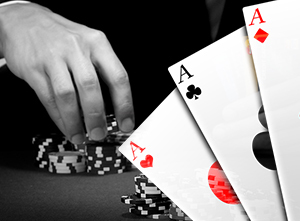 Most online table poker game wagering will begin at $1 per hand and go up to as much as $1,000 per hand. Most of the games have ante, bonus, or side bets with a max bet set at $100 to $500 per hand, and depending on your credit balance. Visit this Casino Poker reviews page to find information on the different poker table games offered by online casinos all over the world, and to see the different and new poker games that have become available to play.